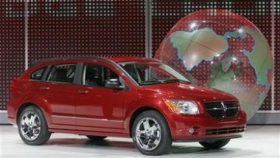 Chrysler unveiled the 2007 Dodge Caliber at the 2006 Detroit auto show. WASHINGTON -- Chrysler Group's 2007 Dodge Caliber cars are under federal investigation for unintended acceleration caused by a sticky pedal -- the same type of problem that led to a large Toyota recall this year. The safety agency has received five customer complaints but no reports of deaths, injuries or crashes. Chrysler's own investigation has narrowed the population of suspect vehicles to 10,000 that were made during five weeks in March and April 2006, a company spokesman said. The problem appears to be a mechanical one caused by parts made by CTS Corp., of Elkhart, Ind., Chrysler spokesman Nick Cappa said. A NHTSA official said the automaker had been cooperative. CTS also was blamed by Toyota Motor Corp. for its sticky gas pedals, which led to a January recall of 2.1 million vehicles. The supplier denied the Toyota charge, noting that the automaker has recalled millions of other vehicles for unintended acceleration that were not equipped with CTS pedals. CTS did not immediately respond today to a request for comment. In the wake of Toyota's worldwide recall of 9 million vehicles for unintended acceleration, NHTSA has been investigating the possible role played by electronic defects in triggering speed control problems across the auto industry. Toyota's problems have been far more extensive -- and far more severe, with reports of dozens of deaths and injuries -- than the possible defects under investigation at Chrysler. Cappa said Chrysler was able to narrow the problem population to 10,000 vehicles after being alerted to customer complaints by NHTSA on April 23 and then comparing complaints to warranty data. On April 29, NHTSA opened a preliminary evaluation, the first stage of a formal investigation, the agency said on its Web site. This review can lead to an engineering analysis and, ultimately, a recall. Four of the five complainants reported that they had found bushings -- bearings made of brass to allow the pedal to pivot -- on the driver's side floor, NHTSA said. Without the bushings, the pedal arm “can become misaligned” and be prevented from returning to the idle position, the agency said. The CTS pedals used in the Dodge Calibers are different from those used in the recalled Toyotas, a NHTSA official said. Chrysler said that since 2003, the Caliber has been equipped with a brake override system that reduces power when both the brake and the gas pedal are depressed. Most Toyota vehicles have not had a brake override system, which would be mandated under legislation to be discussed at a congressional committee hearing Thursday. But some consumer complaints to NHTSA raise questions about the effectiveness of the Chrysler brake override system. One complainant reported that while traveling at 65 mph, the Dodge Caliber accelerated suddenly to over 90 mph, a report on NHTSA's site said. Neither the brakes nor emergency brake could stop the car. It slowed only when the car was put in neutral, the driver said. Another complainant said that while driving his Caliber at 15 mph, it “abnormally accelerated” to 75 mph. The driver reached over and lifted the pedal with his hand, he said. One complainant expressed frustration with Chrysler's response to his reports and appealed to NHTSA to investigate.